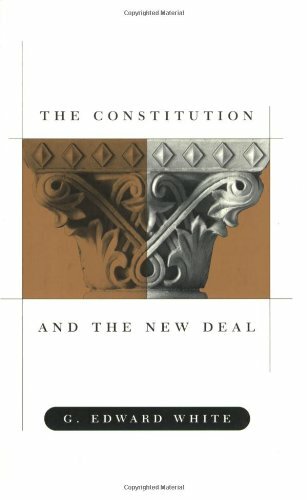 G. Edward White, The Constitution and the New Deal, Harvard University Press, 2000. In a powerful new narrative, G. Edward White challenges the reigning understanding of twentieth-century Supreme Court decisions, particularly in the New Deal period. He does this by rejecting such misleading characterizations as “liberal,” “conservative,” and “reactionary,” and by reexamining several key topics in constitutional law. Through a close reading of sources and analysis of the minds and sensibilities of a wide array of justices, including Holmes, Brandeis, Sutherland, Butler, Van Devanter, and McReynolds, White rediscovers the world of early-twentieth-century constitutional law and jurisprudence. He provides a counter-story to that of the triumphalist New Dealers. The deep conflicts over constitutional ideas that took place in the first half of the twentieth century are sensitively recovered, and the morality play of good liberals vs. mossbacks is replaced. This is the only thoroughly researched and fully realized history of the constitutional thought and practice of all the Supreme Court justices during the turbulent period that made America modern.